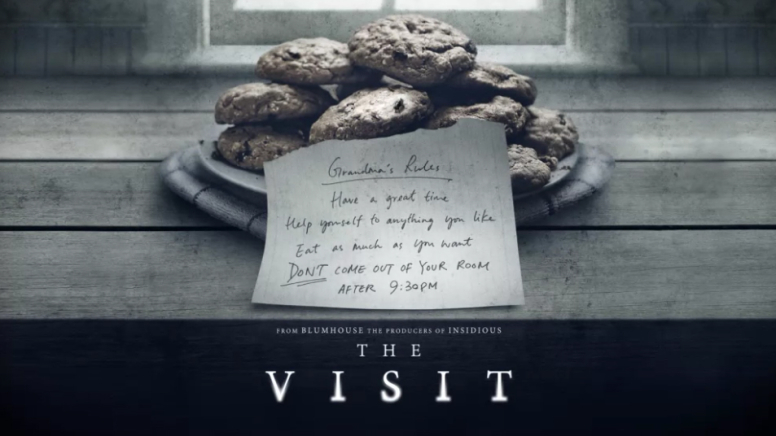 The Visit is a stylistic and narrative triumph, and it’s not inappropriate, even, to term it a come-back for a director who has seen his brand tarnished by negative reviews and box office results. 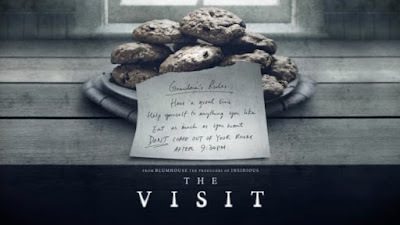 A legitimately scary and disturbing horror movie, The Visit is also an uncharacteristically and chaotically funny film for Mr. Shyamalan. When I remember his past films, I envision shades of gray, a slow-moving, trance-like camera bent on revelation, a kind of swooning approach to the unknown, and the mysteries of faith and the universe explored. Yet there are several moments in The Visit that naturally draw out laughter, and make us feel connected to the film’s young protagonists. This is just what the doctor ordered, in my opinion. So many critics wish to tag Shyamalan as pompous, arrogant, or self-important. This raucous, wildly-imaginative film blows holes in that image and in that argument. The Visit shows us Shyamalan as a mischief-maker, as a Loki-like trickster. 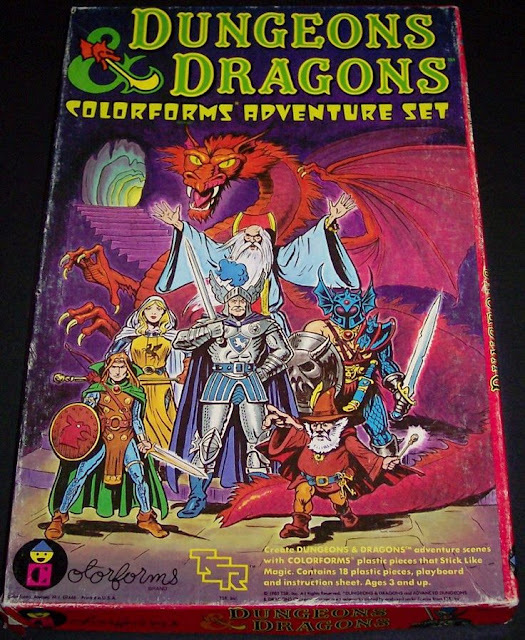 An aura of wicked fun suffuses the picture. And, of course, The Visit is simultaneously utterly grotesque. I wrote about Shyamalan’s descent into nasty, brutal imagery in terms of The Happening (2008) and its opening salvo in Central Park. A scene late in The Visit tops that sequence for sheer visceral impact. You see the moment coming, and can't quite believe it is going to happen. All along in my reviews of the director's films, I have pointed out how they obsess on two particular concepts. One is the protagonist’s search for purpose or destiny, and the ensuing unhappiness felt when destiny is not found, avoided, or somehow lost. And secondly, of course, all of this director’s films in some crucial way involve storytelling, and in particular, the structure of storytelling. How do stories work? How are they assembled? Shyamalan’s movies are a masters-level film class in that subject. From Cole’s lecture about the efficacy of “twists and stuff” in The Sixth Sense (1999), and the two-sides-of-the-same coin “roles” assumed by Elijah Price and David Dunn in Unbreakable (2002), to the layering on of apparently made-up details in Lady in the Water (2006) -- a cinematic bed-time story -- the films in Shyamalan’s catalog explore this concept fully. The Visit is no exception. In terms of destiny or purpose, the film tells the tale of two generations in one family and, in a way, how that story repeats over time. We meet a sweet, single mom (Kathryn Hahn), who reveals, in-talking head, confessional-style interview format, how her husband left her and her young children, Becca (Olivia De Jonge) and Tyler (Ed Oxenbould) for greener pastures. Now Becca is estranged from her distant father (living in Palo Alto), holding on to her anger at his departure from her life, and the fact that he ripped apart their family. Intriguingly, Becca’s journey reflects her mother’s journey. When she was nineteen, Mom ran off with Becca’s Dad, and has not seen her parents since. She fought with her parents before she ran away, and she has never gone home. She has never sought or asked for forgiveness from them. However, Becca believes her destiny is to get that forgiveness for her mom, hence the “visit” of the title to the grandparents’ house in rural PA. But in fact, Becca’s journey is actually about her own purpose; her own destiny…she just doesn’t see it. She has erased her Dad from her life, and won’t even include clips of him in the family documentary she is making. She is making the same mistake, essentially, that her mom did a generation ago. She is holding on to hate. On the second front -- meditations on storytelling -- Becca is, delightfully, characterized in The Visit as a knowledgeable budding filmmaker. She is bent on recording “the visit” to Pennsylvania and crafting a documentary about her mother’s journey and hopeful reconciliation with her folks, now well into their seventies. But throughout The Visit there is abundant and trenchant commentary on mise-en-scene, talk of narrative “elixir,” lessons on framing, and even jokes about film history. One running gag involves the idea that virtually everyone (with one exception) Becca encounters fancies him or herself a good actor. The camera is our constant eye in The Visit, and the movie's message at points seems to be that even though the camera records what it sees, it may not understand the whole picture. It may miss something crucial…some basic, unspoken truth. Stories -- as we’ve seen before from M. Night Shyamalan -- are not about twists so much as they are about the assumptions we make. The Visit suggests, we are holding on to assumptions about other people, and about their beliefs. The camera can’t account for those assumptions in what it records or sees. It sees only what is physically before the lens; not the untold layers beneath the surface. 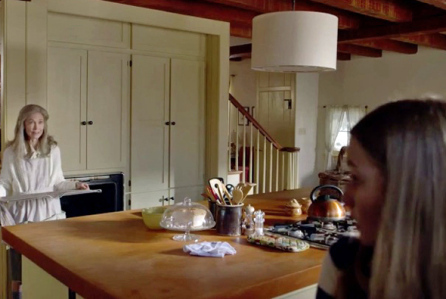 The switch in perspective (what critics call the twist ending) in The Visit involves something the camera could never have understood in the first place. Reality is not as it seems. Without giving away, I would merely note that The Visit possesses a startling, simple twist that alters our perception of the truth. It is so simple a revelation, in fact, it might even seem basic or rudimentary. But I never anticipated it; never saw it coming. Not for a second. Frankly, I was floored. That suense of surprise may result because (unlike The Happening), Shyamalan has cast so efficiently here, and the actors inhabit their roles. Or it may be because Shyamalan seems to possess no fear about taking the film to uncomfortable plateaus involving the indignities of old age, not to mention mental illness. He distracts us with these things and ideas. He sends us off in directions that lead us down the wrong path. Accordingly, The Visit not only is a remarkable and effective edition to Shyamalan’s canon, but a ripping good story too, a horror movie that comes at you in a way you don’t quite see coming. Young Becca (Olivia DeJonge) and Tyler (Ed Oxenbould) agree to visit their grandparents -- whom they have never met -- while their mother (Kathryn Hahn) goes on a cruise with her new boyfriend. Becca and Tyler are still coping with the fact that their father has moved away, and is no longer a part of their lives, but they want their mom to, finally, be happy. Becca also plans to make a documentary about the visit in hopes of getting her Mom the “elixir” she needs to transform her life. Specifically, Mom and her own parents, now senior citizens, have never reconciled after a terrible fight years earlier; a fight in which Hahn ran away. Becca wants them to put that past to bed. At first, Becca and Tyler enjoy staying with Nana (Deanna Dunagan) and Pop-Pop (Peter McRobbie), a sweet if eccentric couple who, for years, have devoted their life to counseling the sick and infirm at a local facility, Maple Shades. But weird things start to occur during the kids’ visit to their grandparents. After 9:30 pm, for example, Nana acts strangely, prowling the hallways. Meanwhile, Pop-Pop insists they shouldn’t be alarmed; that it’s just “sun-downing.” Pop-Pop also has a messy secret he keeps in his tool shed, away from the house. The longer Becca and Tyler stay at the isolated old home, the more disturbed they grow by the behavior of Nana and Pop-Pop. One night, Nana grabs a butcher knife, and turns violent. And one day, Becca discovers Pop-Pop apparently on the verge of suicide, a gun in his hands, aimed at his mouth. But what is the truth here, and are Becca and Tyler prepared to learn it? 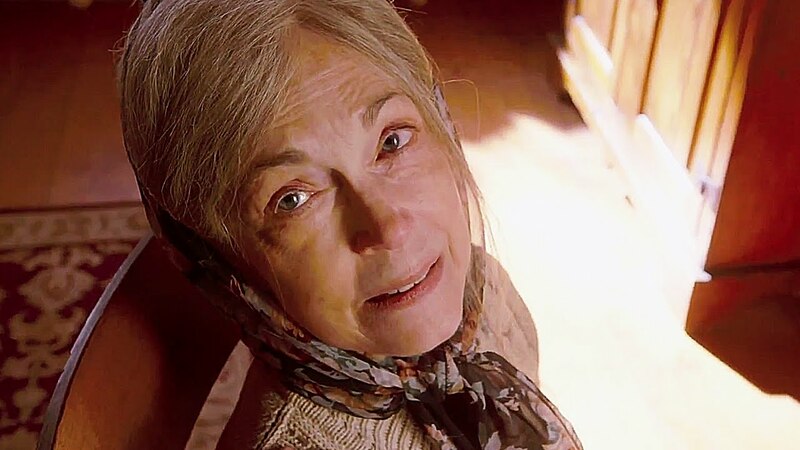 The Visit (2015) probably isn’t going to win any awards for its sensitive depiction of the old or the mentally-ill. In fact, the film regularly conflates those two categories to a degree that some may find objectionable. I have a 95 year old great uncle, and he isn't "scary" because of his age, or because of his behavior, either. But it might be accurate to note that his behavior is different from mine, or my wife's or Joel's. Some daily things we take for granted, he has trouble with. The Visit isn't particularly nuanced about understanding this, but in a sense, it doesn't need to be. Above all, this remains a horror film, and so Shyamalan abandons restraint, and delivers a work of art about old folks who are, to put it politely, absolutely bonkers. Even at the film’s most outrageous, and creepy heights, however, Shyamalan makes at least some attempt to demonstrate balance. Young Tyler, for example, has a long-standing problem with germs, and when you think about it, that neurosis is not entirely different from the “issues” we see Nana and Pop-Pop dealing with in their old age. What works about The Visit, then, is not any kind of serious message about the old or the mentally ill, but rather the film’s anarchic and unpredictable sense of humor. The success of a scene involving Becca and Tyler playing hide-and-seek under the old house knowingly hinges on our uneasiness with Nana, and lunges between horror and laughs with great fluidity and flair. Shyamalan’s game is thus to keep us off-balance, off-center throughout the film, so we can’t see the forest for the trees, and in a real sense, that works well given the subject matter. Again, I have a 95 year old great uncle whom I sometimes watch movies with, or otherwise interact with, and his responses to routine matters are somewhat...unpredictable. I talk a lot on the blog about form echoing content, and the humor/horror unpredictability of The Visit reflects the film's senior citizen characters andd their mercurial, capricious behavior. When approaching them, you aren't certain what you're going to face. The Visit, again, is a horror film so it knowingly transgresses; it doesn't deal in subtleties but literally in gross exaggerations. It is rewarding that Shyamalan is able to maintain unpredictability for so long in The Visit, especially given the parameters of the found-footage format, which hinges on the absence of artifice and the heightening of immediacy. Suffice it to say that Shyamalan takes that idea of immediacy to a new zenith here, particularly in a sequence involving phobic Tyler, and incontinent Pop-Pop. There are times, in The Visit, when you aren’t sure if you should laugh or scream, and in the screening I attender, there was palpable air of uneasiness in the auditorium, and a lot of nervous laughter. And again, this response proves to me that Shyamalan is a bit of a stylistic whiz, even if you aren’t willing to follow his narrative flights of fancy. He knows exactly to milk the most out of a particular scene or moment, and The Visit is disarming in its mix of queasy laughs and horror. Actually, Shyamalan has a lot of fun with the audience and its expectations here. He unspools, at length, a scene in which Nana tells a bizarre story. It’s a story about aliens in a nearby pond, you see; aliens who possess people with their spit, and put their souls to bed at the bottom of the pond. It’s a beautiful sleep, she assures Rebecca. The story about the pond plays one moment like a red herring, and then later, like a tragic fairy tale, a justification for a horrible, monstrous act. This strange tale explains, succinctly, why I love the films of M. Night Shyamalan. The aliens in the pond story means different things, depending on our level of understanding of the narrative. It is a little funny at first, and then, eventually, haunting. So if there is a useful message to walk out with following a viewing of The Visit, it’s but this: don’t hold onto your anger. It will destroy you, and you will lose precious opportunities if you do hold onto it. I feel that, in some way, The Visit is thus Shyamalan’s “peace” offering to the world. Remember how he went after critics and appeared thin-skinned with the Farber critic (Bob Balaban) in Lady in the Water (2006)? That character and that subplot arise out of anger, in a way, about how Shyamalan’s movies have been received. I feel that with The Visit, Shyamalan has finally put down that anger, and endeavors, simply to recommend that the audience and critics do the same. He’s going to keep doing what he loves -- entertaining us with stories about destiny and the structure of narratives themselves -- and we can respond in whatever way we choose to. But he isn’t angry anymore, and we shouldn’t be, either. Shyamalan has found this sort of Zen place, at last, and that The Visit gets to express that at-peace philosophy in a meaningful way. 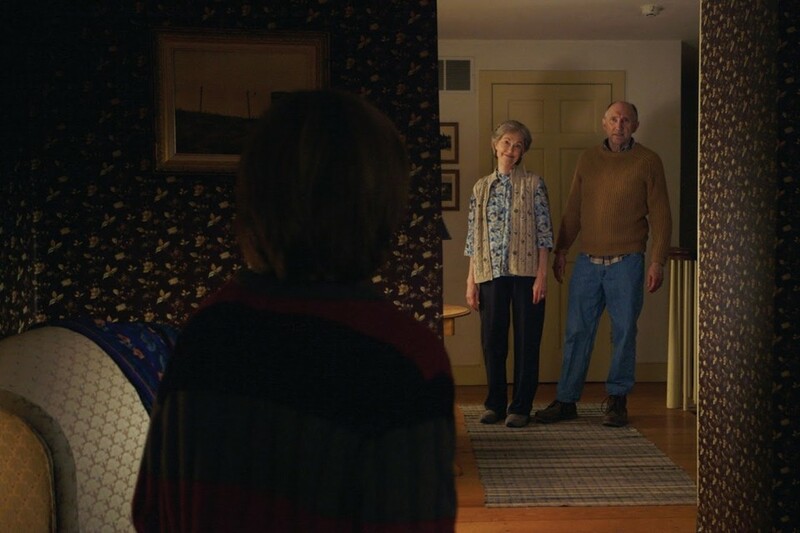 The Visit, moving dazzlingly from laughs to horror, ends on an emotional high note, an affecting reminder, finally, that we should be decent to the people in our lives whom we care about. Because they won't be here forever.